Icy niblets of snow are starting to fall from the sky when I leave Central Oregon in mid-February, headed for Jim Belushi's cannabis farm in southern Oregon. When I get there, the fertility of spring abounds. Jim Belushi surveys his indoor "science experiment," as he calls it, of Captain Jack, while a photo of his brother, John, looks on. The sun is out, casting whitish-yellow beams onto the Rogue River. Jaunty squirrels dart across the dirt driveway leading to the 93-acre spread. A herd of mama cows have just given birth to a gaggle of calves, legs still wobbly after their recent arrivals. And then there's Becca, whose presence is everywhere. She's the former matriarch of most of this property, who passed away a few years back—but not before making friends with her new neighbor, Belushi, who had purchased the tumbledown Elks picnic grounds next door for his own personal retreat. "I just fell in love with the girl. She had esophageal cancer," Belushi said. "It was just really sad—it was a neighbor that turned into a gift. She wanted me to take care of Charlie (her husband) and she wanted me to have the farm. And so I bought the farm, and Charlie's got a life estate there." Now with far more land than he started with, Belushi set out to do something more than chill out and host the occasional music show on the stage under the old Elks picnic shelter—one of the features that drew him to the land in the first place. Southern Oregon is known as Oregon's banana belt: lots of sun, and temperatures great for growing pears and grapes—and increasingly, cannabis. Belushi began his foray into cannabis just after Oregon voters approved the legal recreational market in 2015, using the original farm name, Rogue's Lair. After a few seasons of experimentation, Belushi told me he felt ready to add his name (and its star power) to his product. Today, Belushi's Farm is selling flower in dozens of Oregon dispensaries. 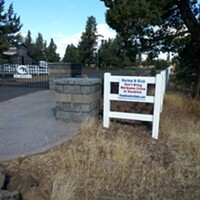 In Central Oregon, that includes HD Botanicals, Diamond Tree and The Herb Center. The cannabis may now bear his name, but Becca's legacy lives on. "This is a very warm, sweet, feminine feeling, from Becca being here—the master, the matriarch of this land," Belushi said. "Her energy... to the cannabis plants are all feminine, to the 50 cows that are giving birth, there's just this beautiful energy here that's very compassionate and lovely—and that kind of love and feeling comes right through the plants." Belushi's greenhouses stand in the background, while his favorite cow mother, who he says babysits all the babies, poses with her newborn. Our tour of Belushi's Farm included stops at the myriad outbuildings, shops and barns that dot the property. Near Becca's large, former hay barn stands the shed Belushi calls The Museum, stuffed full of old bolts, hinges, bits and bobs Becca and family saved over the years. "I used to accuse her of being a hoarder, but she just said, no, I'm not a hoarder, I just save some precious things," Belushi laughs, waving his ever-present cigar. The shed was made from reclaimed materials—before reclaimed materials were in fashion—that Becca's family obtained from the former Camp White, now called White City, near Medford. The WWII-era facility served as an Army training ground, and also the temporary home for more than 1,000 German prisoners of war. A story in Medford's Mail-Tribune describes how the camp was also home to a top-secret project, aiming to re-educate Nazis in the "principles of democracy." If Becca was also keen on hoarding stories, she was clearly good at it. 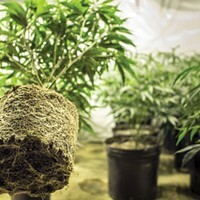 Also clustered near the barn and The Museum is another barn, where Belushi and his team are growing over 400 Captain Jack plants—a strain from the Afghan Kush region, handed down to the legendary grower, Captain Jack, by Afghani villagers over 40 years ago. Former "Saturday Night Live" stars like Belushi called the strain the "smell of SNL." "This is the most creative, inspiring cannabis. It was the strain of SNL," he said. "We had some and all of a sudden we're coming up with jokes and popping each other." Belushi, who obtained Captain Jack's strain on the recommendation of fellow SNL veteran, Dan Aykroyd, is working with Portland-based Phylos BioScience to develop the best-possible version of Captain Jack before he releases it next year. Belushi inherited Becca's shed, built from materials from Camp White, still full of bits and pieces that might have come in handy on the farm. Belushi grew up in Illinois, lived in New York during his SNL days, and names his primary residence as Los Angeles. Does that put him in the camp of other Californians, categorically mistrusted by Oregonians? When I asked him about this, Belushi said he hadn't personally experienced the type of neighboring-state discrimination that you hear talked about so often—at least among Central Oregonians. Later in the afternoon, after having some time to think about that dynamic, Belushi had something to say on behalf of the Californians who transplant to Oregon. Of California, he said, "It's crowded." In other words, is it any wonder Californians want to relocate? Belushi, as one of those (at least part-time) transplants, has certainly added to the community. The day after our visit, he was headed to the ceremonial "groundbreaking" for the Holly Theatre, a 1930s-era Spanish Colonial movie house and Southern Oregon's largest concert venue, whose renovation fund was greatly lacking before Belushi began adding support. He was also practicing his "gruff" voice in preparation for a storytime at a local school, where he would read "The Three Billy Goats Gruff." Indeed, his ability to toggle between effecting the voice of a gruff billy goat, to talking about terpenes, to pontificating about the role marijuana might play in combating the opioid crisis—a notion spurred by his own brother John's death from a combination of heroin and cocaine—may be just some of the reasons people have embraced him so fully in this part of Southern Oregon. In any case, it's safe to say Becca approves.